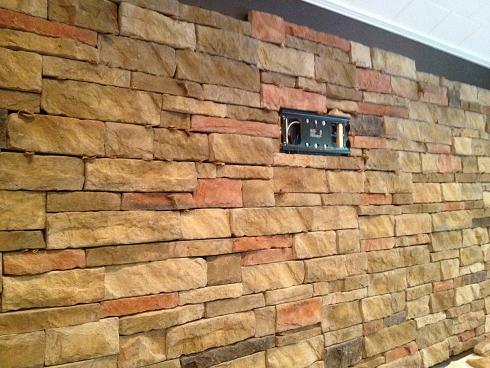 Had a customer call me from Brandon, Florida that wanted to have manufactured stone installed on an accent wall in his home. 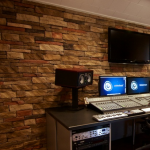 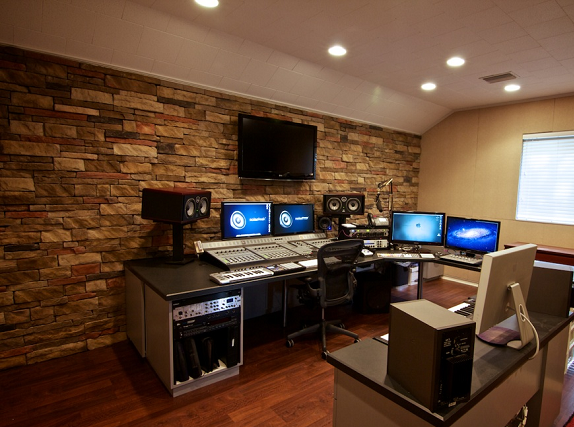 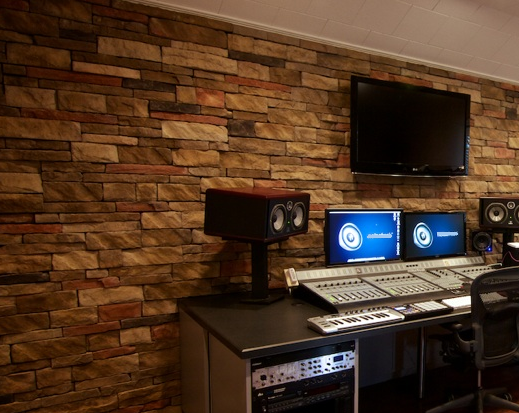 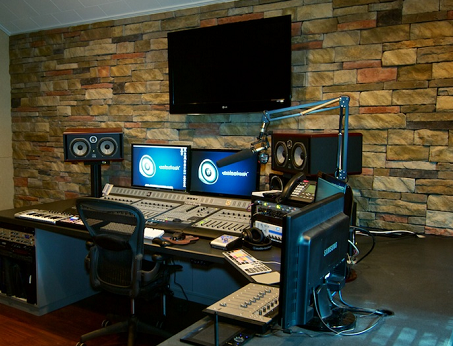 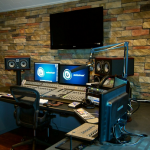 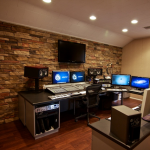 He owned a recording studio and wanted to use the stone as a sound buffer as well as a nice looking accent wall in the studio. 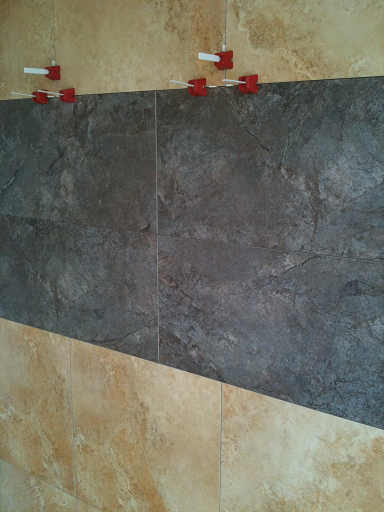 We set up an appointment for a measure and I also showed him some brochures on stone we used. 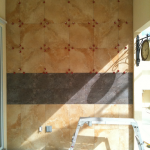 He wanted a square style stone with a clean natural looking color and also some light red here and there. 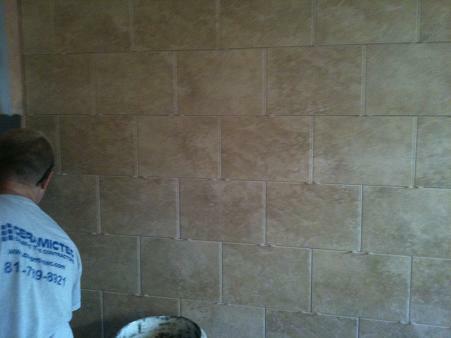 I showed him a few brochures and he decided on a Suncrest Stone style. 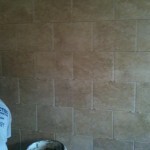 The color he selected was a Madison County Stack. 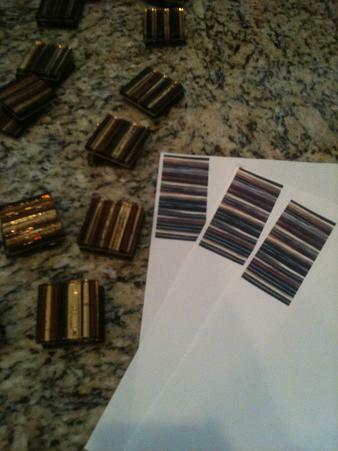 I contacted my supplier and had them send out an actual sample board with the pieces on it for him to approve. 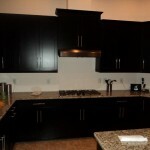 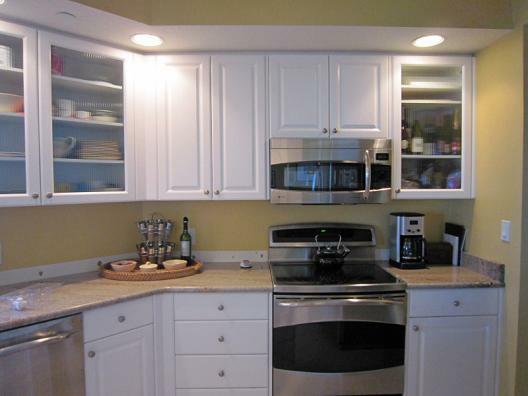 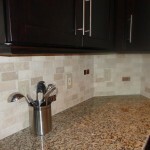 Once the homeowner received the sample board he confirmed that the color and look was what he wanted. 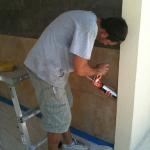 I made a contract for the project and got it to him to get the ball rolling. 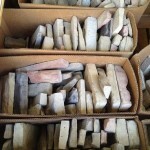 We received the deposit for materials from the owner and immediately ordered the stone from our stone yard. 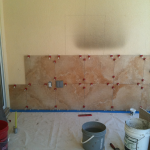 The supplier gave us an estimated delivery time so I set up an installation date with the homeowner. 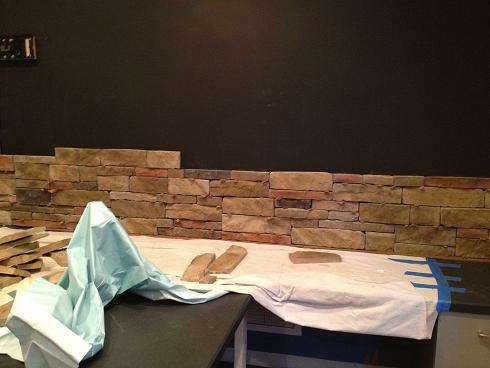 The owner also wanted to make sure his bright blue wall didn’t show through the crack of the stone so he painted the wall black. 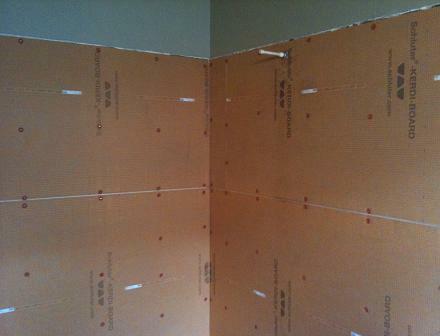 He also had a new acoustic ceiling install prior. 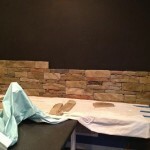 When the stone came in we picked it up the morning of the installation and headed to the project. 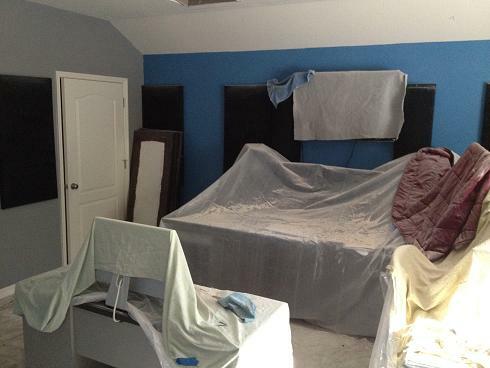 We got to the project and the room was already cleared and ready for us. 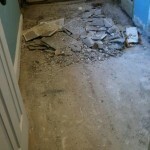 We put down our drop clothes, got our tools out and loaded the stone into the room. 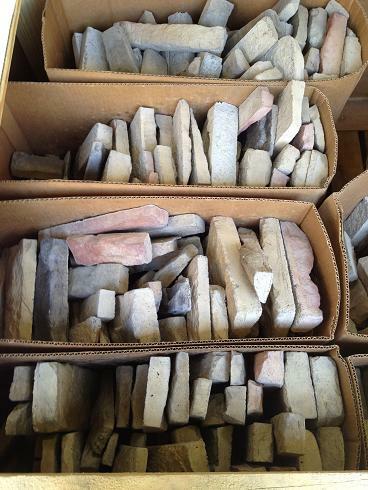 We also took a lot of the stone out of the boxes and laid them out in size and shape order. 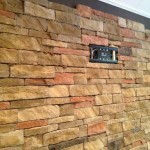 We do this so we can install them easier and know where things are faster without having to search for that “perfect fitting stone“. 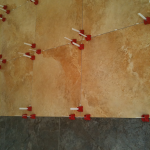 I did a fast measurement of the wall and stone and then did the layout to get a game plan. 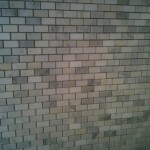 I was using Laticrete Masonry Veneer Mortar since I really like it’s bond, I mixed some up as per manufacturers instructions. 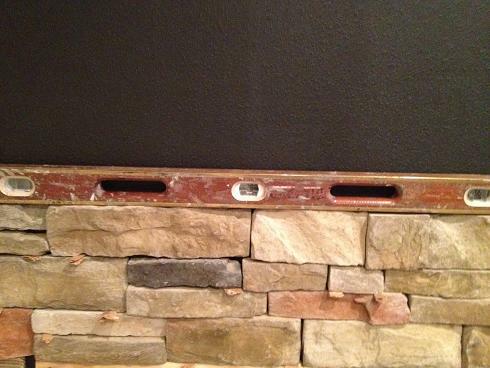 I started my first row off the desk since it was mounted to the wall. 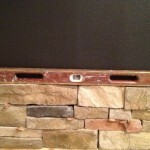 I also used some cardboard strips to allow for movement and expansion between the stone and desk. 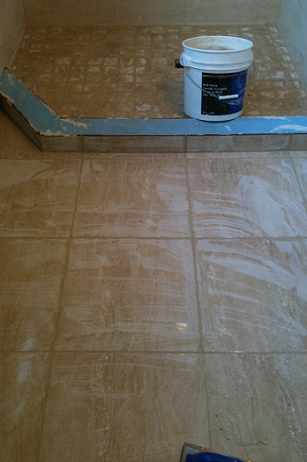 The first rows went in smooth really smooth and I was happy with the look already. 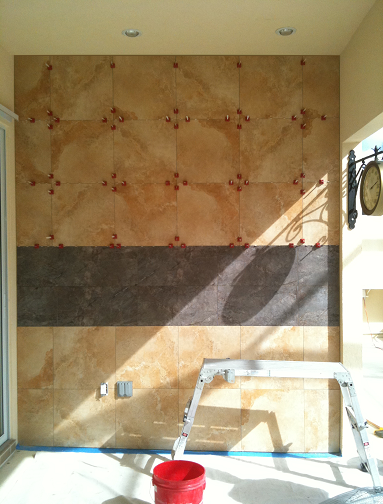 I worked my way upwards back and forth placing each stone in the right spot to achieve a random stacked look. 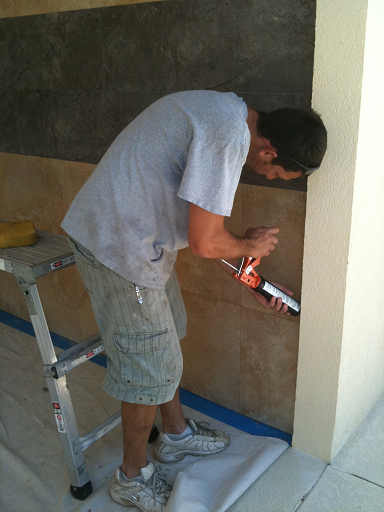 The Suncrest stone is well made and easy to install. 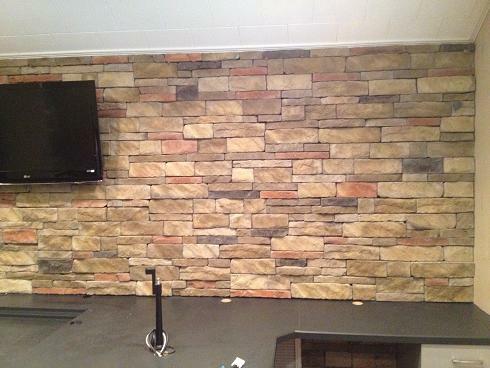 The homeowner also wanted a flat screen tv mounted to the stone wall. 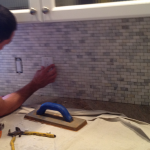 We had to cut around a mounting bracket and bury the cable as we installed the stone. 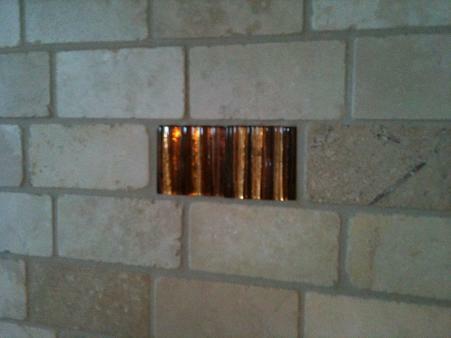 It was pretty easy to hide under the stone since the mortar setting the stone was pretty thick. 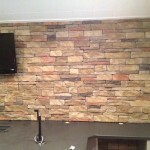 The rest of the stone installation went well. 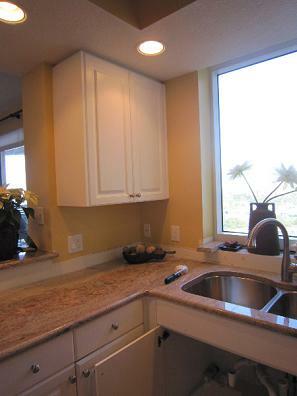 We cut in the stone at the top near the ceiling. 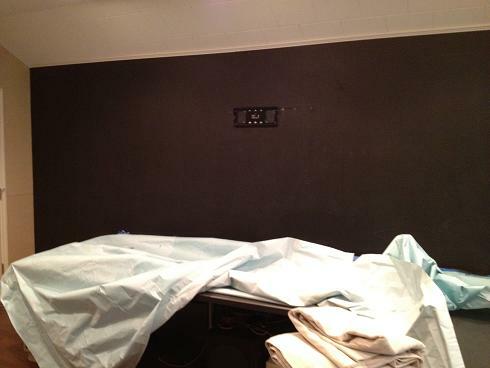 The sides, bottom and under the desk was install level and came out perfect. 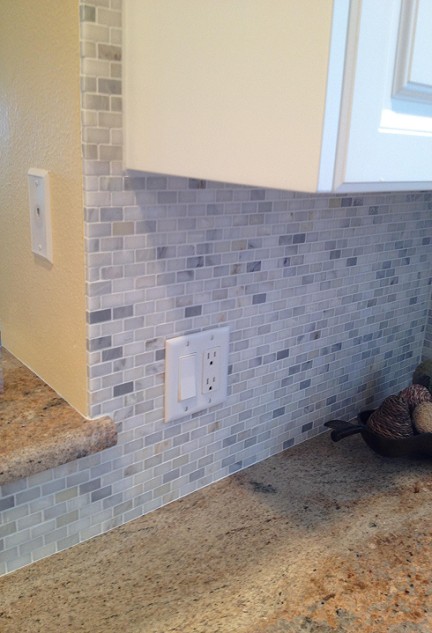 mounted the flat screen on the wall and installed a couple outlet plates. 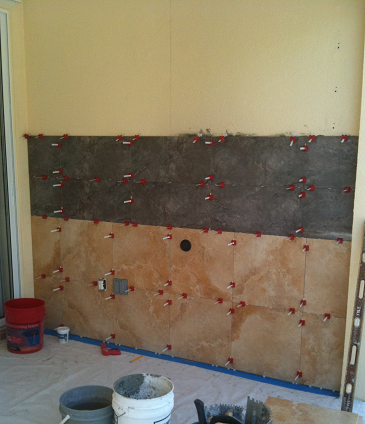 We asked the homeowner if he wanted the stone sealed. 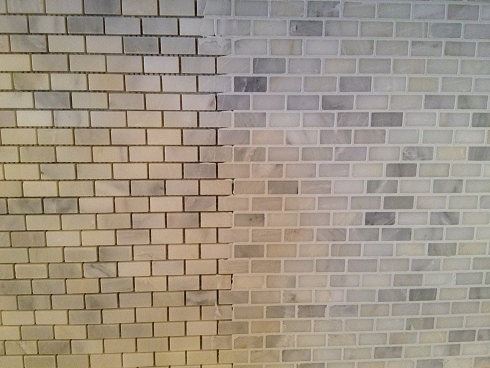 He didn’t and wanted the flat natural look. 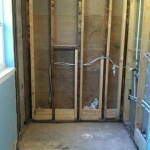 After we cleaned up the project the owner put back all of his electrical stuff and got things back to normal. 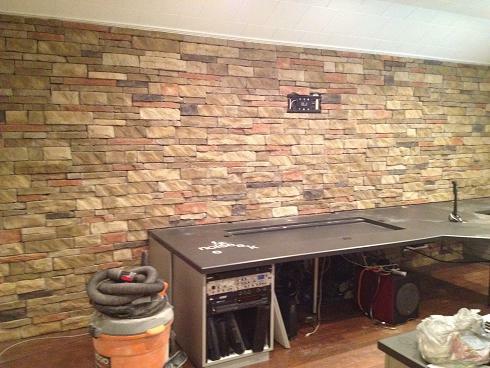 He was very pleased with the turn out of the interior stone veneer wall and loved its function in his sound room. 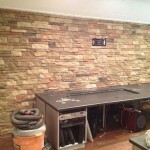 He already referred us to another client who we just completed a fireplace for. 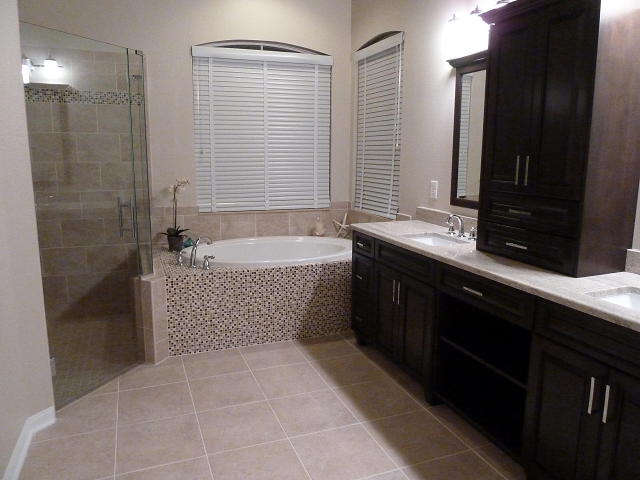 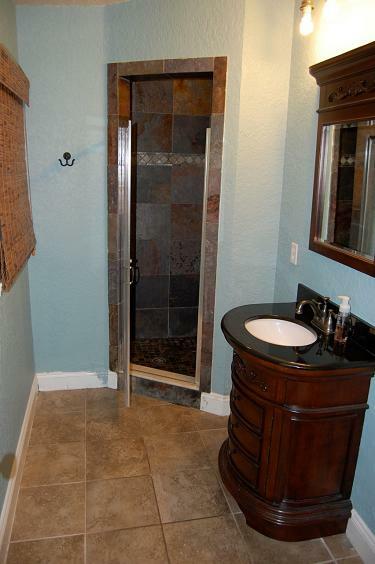 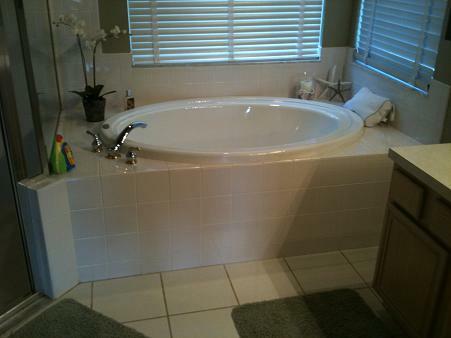 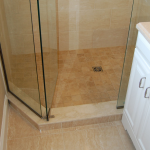 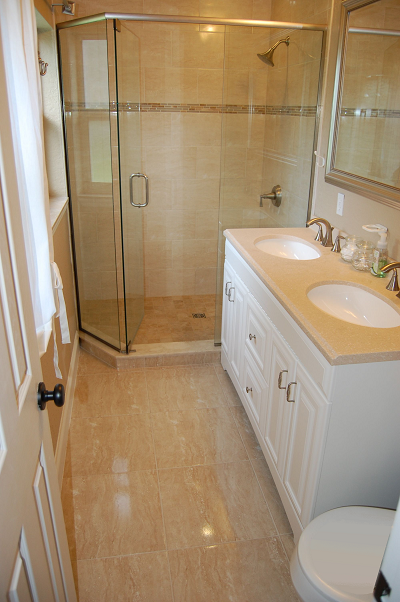 We recently completed a custom bathroom renovation in the Westchase area of Tampa Florida. 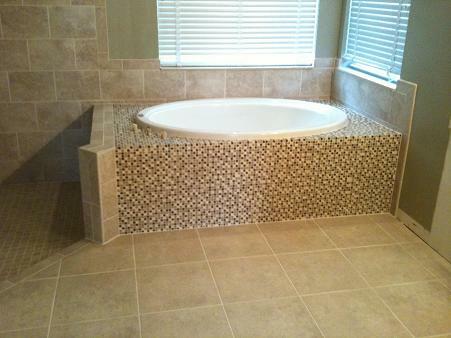 The customer had contacted us with an idea to do a full bathroom remodel and wanted help on the tile. 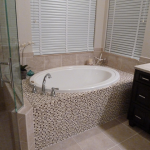 After a phone conversation with them I had a feel of what they were looking for and sent them to a couple tile showrooms in Tampa to look at tile. 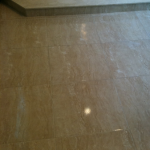 At the first showroom they found a 9×13 porcelain tile from Keraben named Augusta Bone which also had a 3×13 surface bullnose tile. 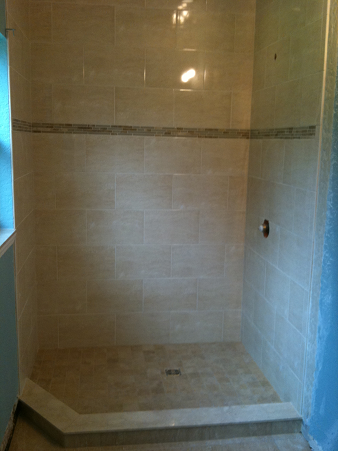 They selected that to be used on the shower walls. 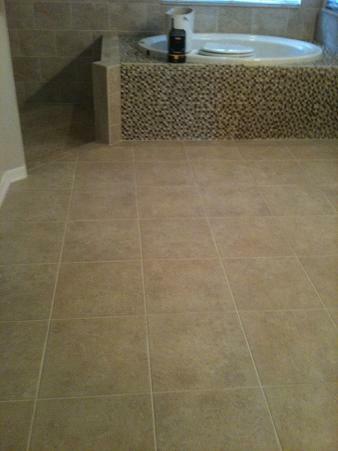 They also selected the Augusta Bone in 20×20 to be used on the main bathroom floor. 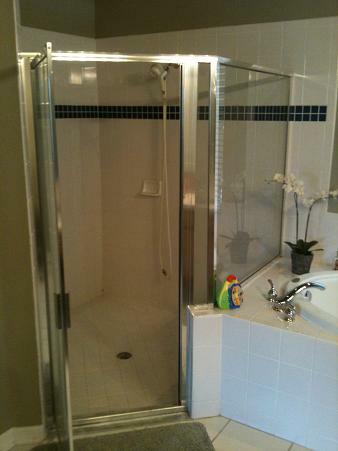 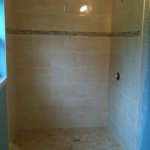 Then they went to Alpha Tile and found the shower floor tile they liked which was a Cosmos 2×2 Cream and also a 5/8″ glass mosaic tile of caramel & tan glass with creme travertine for the tub deck and face. 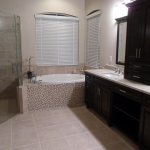 I worked them up a proposal to do the demo of the glass enclosure, shower walls & floor tile installation, the tub deck tile and main floor tile. 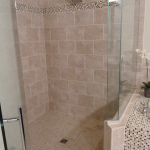 The price also included the installation of the pitched shower mud bed, the Schluter Kerdi-board waterproofing in the shower, building a niche & shower seat and also the tile installation in all areas. 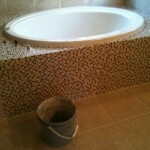 I also worked into the price supplying the tile from both distributors for the project to make it easy on the customer. 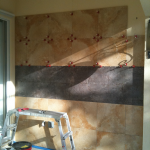 The customer signed our tile installation agreement contract and gave us the deposit for the materials which locked in the installation date. 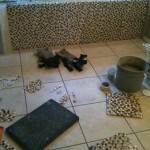 I called both suppliers and put in the order for all of tile in the amounts needed. 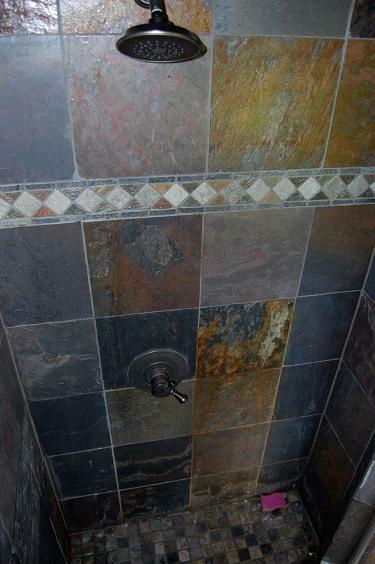 I also had to make a list of the other material I needed to get like the Schluter Kerdi, Kerdi chrome drain, thinset, grout, pre-blended sand/portland mix for the shower pan, caulk, wax toilet seal and material like that. 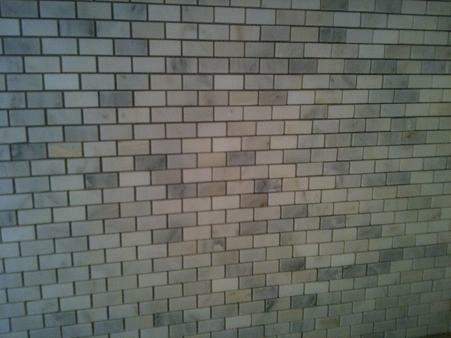 All of the tile came into the warehouse prior to us starting the project. 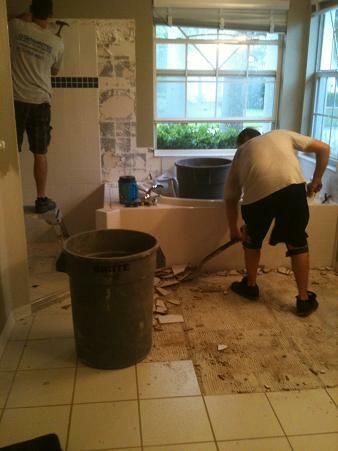 We showed up the first day and unloaded the tile and started to do the shower rip out. 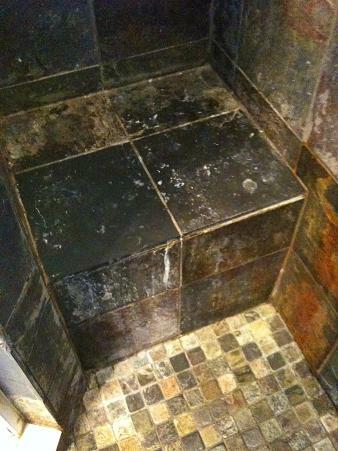 We first took down the glass enclosure and ripped out the tile around the edge of the shower. 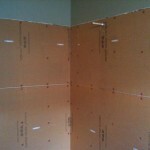 I do this so we can cut out the wall and not affect the painted area we wont be tiling. 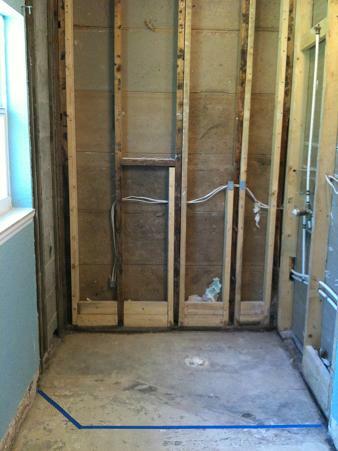 We removed all of the wall tile and drywall in the shower and removed the tile off the tub. 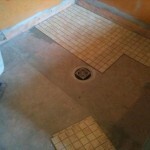 We also ripped up the old shower mud bed and shower floor tile and jack hammered up the main tile in the bathroom. 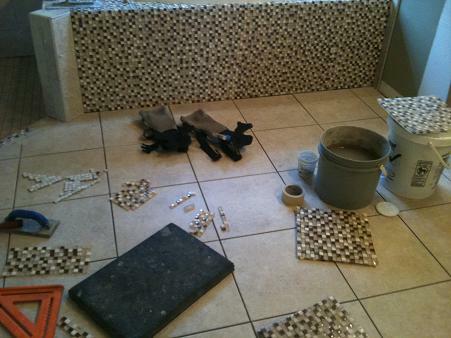 We dump all tile debris in the Bagster we use on each job which makes things a lot easier on us. 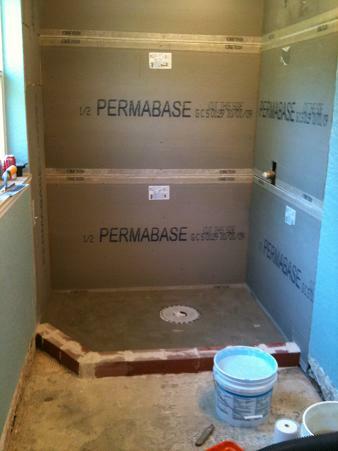 Once all of the tile was removed and disposed of we started on prep work and the installation of the Kerdi-board waterproofing. 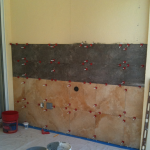 We packed the mud pan and then installed the Kerdi on the fresh mud which is faster for us and expedites the completion of waterproofing. 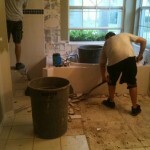 We completed everything that day and were ready to start setting tile the next. 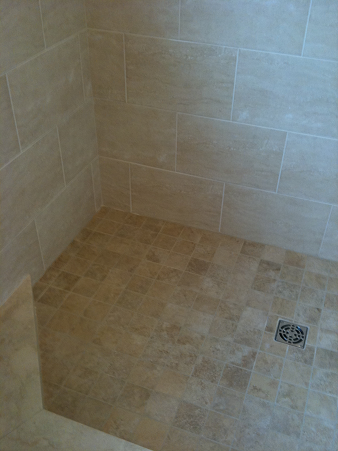 We got to the job and the first thing I did was do the layout in the shower. 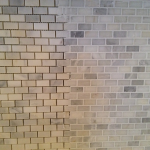 In my earlier meeting with the homeowners we determined that the 9×13 wall tile was going to be set in an offset brick pattern. 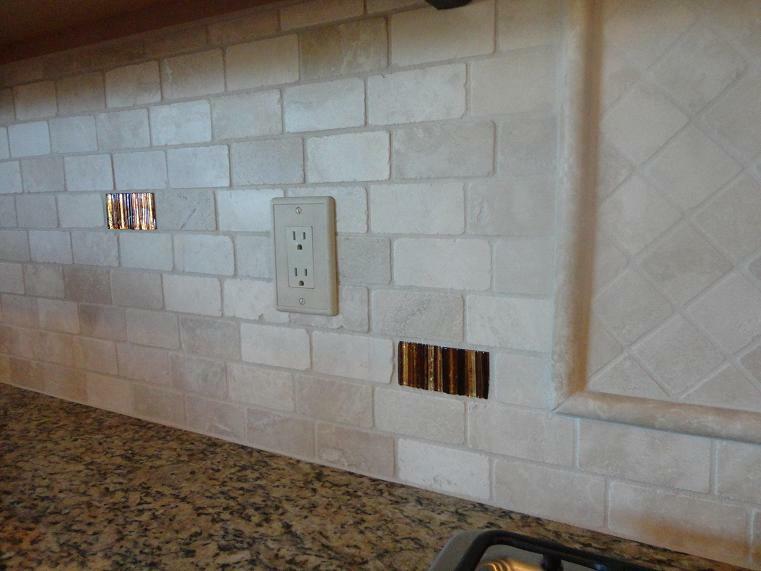 After the layout was done we set the tile all the way up to the accent band, then after lunch we did the glass & travertine accent band and finished off the top row of tile and bullnose. 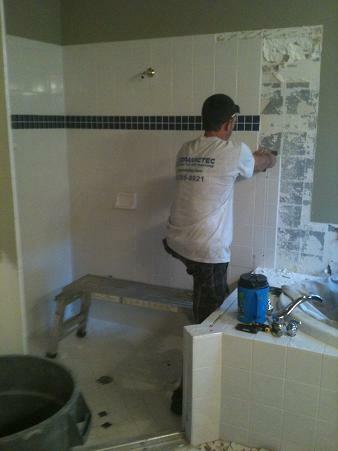 Just before we left for the day the last thing we did was set the 2×2 mosaic tile on the shower floor. 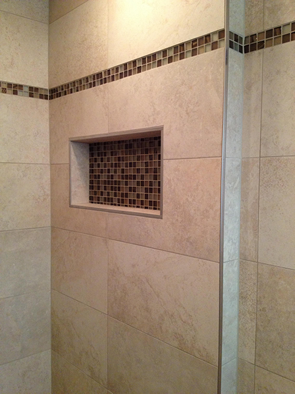 The next day I finished tiling the niche which used the glass & travertine in the back of it and also completed the shower seat. 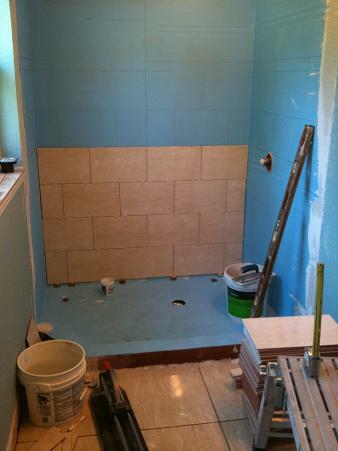 We installed the 20×20 floor tile on the main bathroom floor which took the rest of that day. 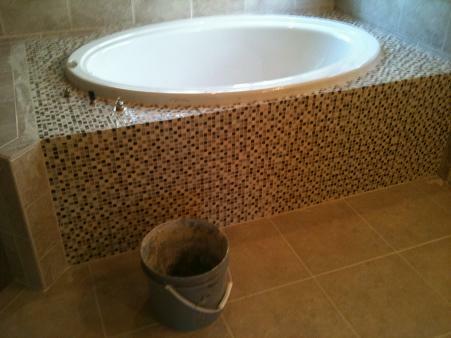 Then it was onto doing the glass & travertine tub deck which took us a full day since it is very detailed and tedious work. 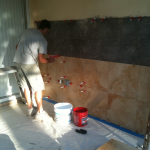 After all the tile was installed we did the marble sills on the windows and then grouted all of the tile. 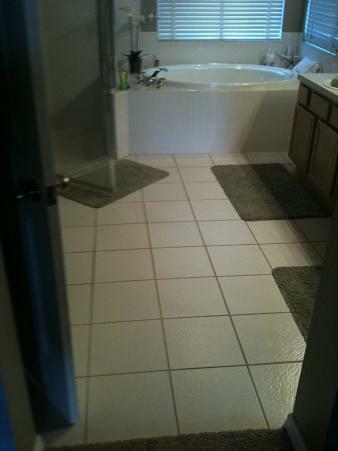 We did the final wash to make all of the tile clean and then reset the toilet and some caulking in the corners. 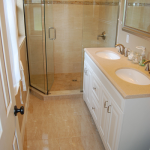 After we were completed the homeowner had the room painted, a new vanity and a granite counter installed, new shower head, shower control, sink faucets, tub hardware and to finish the room a custom made frame-less shower enclosure. 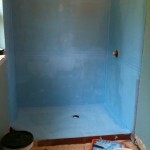 hope you liked reading about this project and will enjoy the pictures. 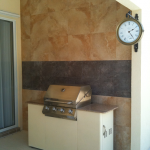 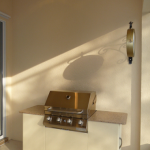 I received a call from a customer in Bradenton, Florida who wanted to do tile on his lanai grill wall. 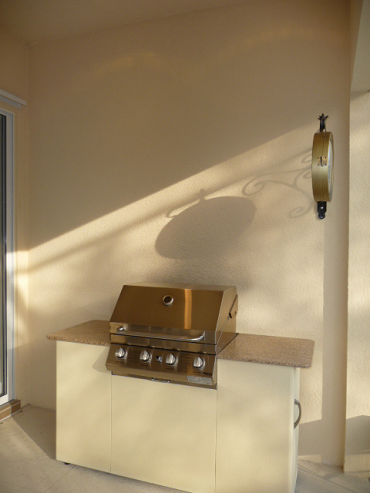 The reason for this was his grill was leaving smoke stains on the stucco and there was also some splattering from grilling. 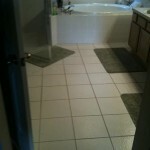 He got the idea of doing tile to stop the splattering and grease stains and also ease of cleaning. 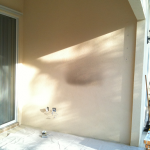 He emailed me the measurements of the wall and also some pictures and I was able to give him an installation price that he later accepted. 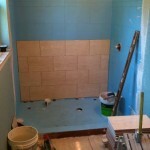 I then sent him to a couple of the tile store we use in the area. 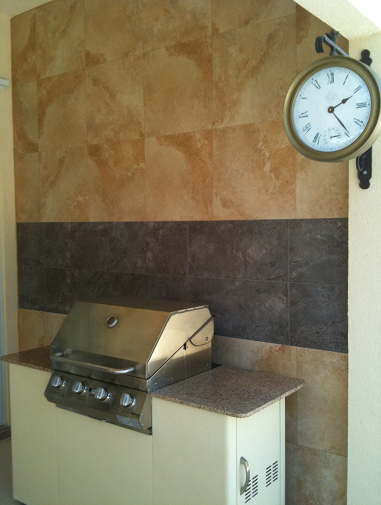 He found a nice tan rectified 20×20 and also a gray rectified 12 x24 as a border band behind the grill. 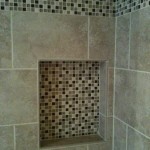 I had him select a grout color while he was there. 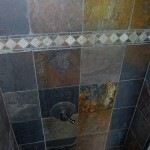 He selected a matching gray grout for the gray tile and a tan grout for the tan tile so they would blend nicely and not have a clashing grout line in either. 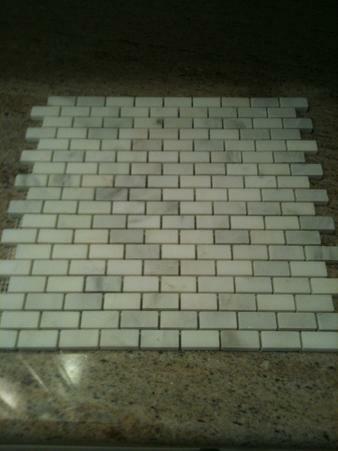 The tile came in at the warehouse and the customer picked it up a couple days before we started. 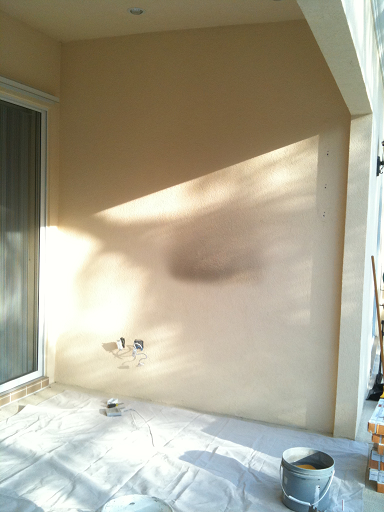 We arrived at the job and the first thing we did was cover his lanai concrete with our drop clothes to protect the work area. 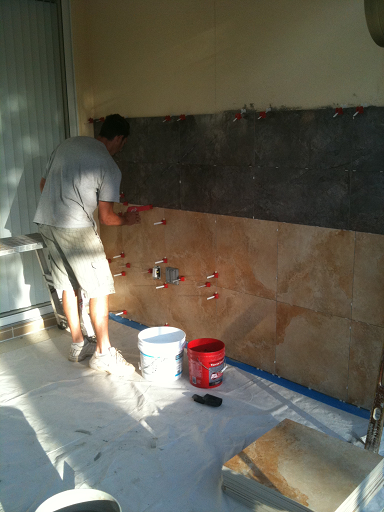 We then put on some outlet box extender for him so they would sit out further on the finished tile. 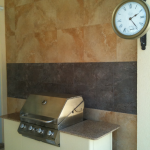 I got the tools out, set up the wet saw and then inspected the tile in the boxes to make sure they were all the same lot, size, color, etc.. After we were set up I did the layout on the grill wall. 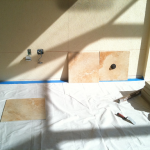 I found the center line and made the plumb mark and also made a horizontal line allowing for a full tile and the lowest part of the pitched lanai. 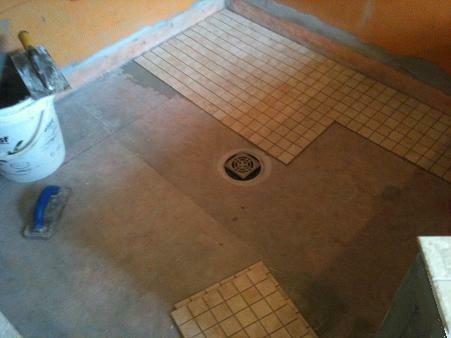 The lanai is pitched away from the house for drainage so care was taken to make sure there would be no slithers of tile. 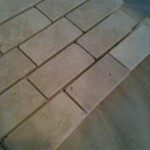 I then proceeded to mark the tile on the needed angle and cut the first bottom row tile on my wet saw. 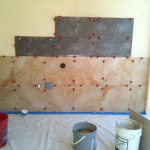 After they were cut I mixed up some modified thinset and started to install the bottom row. 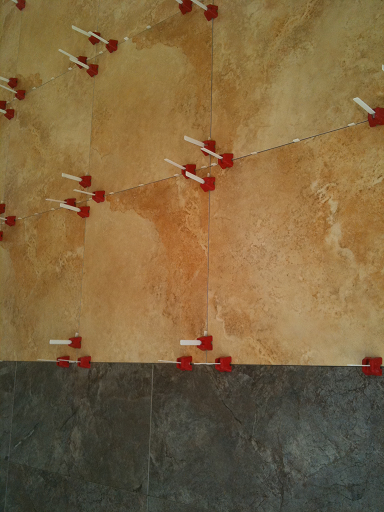 I use the TLS “Tuscan Leveling System” on installs like this to ensure the tile is set flat and smooth during the installation. 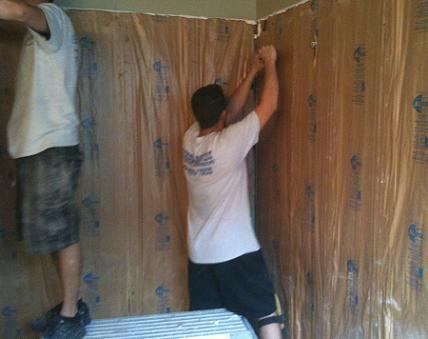 The TLS system allows the installer to get a “lippage” free wall or floor by using the straps and caps. 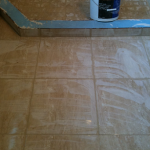 To me it makes it easier to get a smooth tile project rather then fighting with packing/adding thinset and having the tiles sag and drop when the thinset dries. 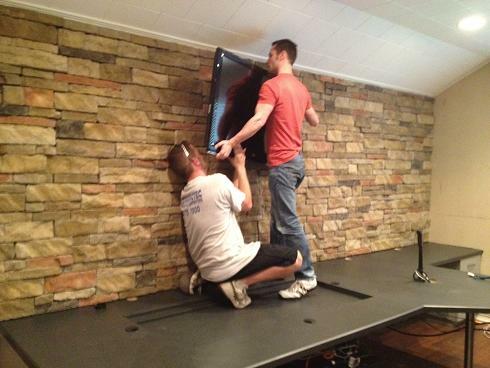 You can see in the pictures the red caps that are being used with the white straps. 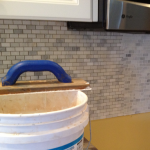 They stop the tile from moving while holding the faces of the tile flush while drying. 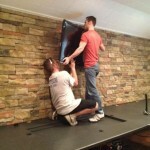 It also makes my job a little bit easier. 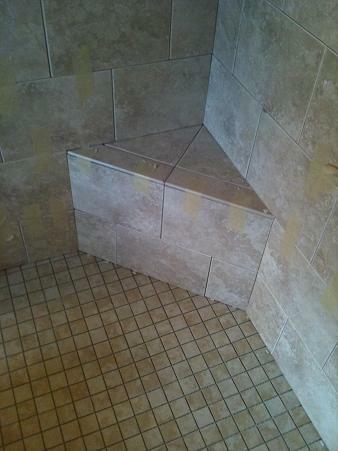 I am using a tight joint with this tile, about a 1/16 of an inch and had my wedge spacers holding them up. 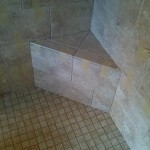 After the first row was installed level and side cuts were made I started on the second row. 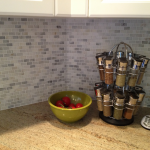 The second row went up nice and easy since the bottom row was perfectly level and the faces locked in flat from the TLS. 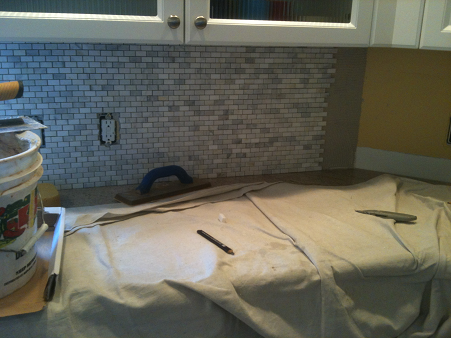 That first day I worked my way up to the gray accent band tile and finished. 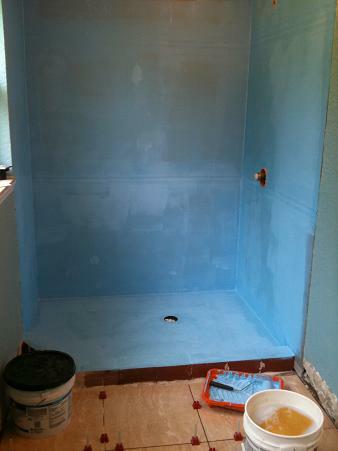 We let it dry and came back the next day and started on the area above the accent band. 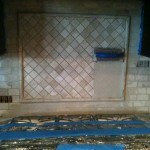 Once we completed setting all of the tile on the top area we popped the Tuscan caps and prepped the lower area for grouting. 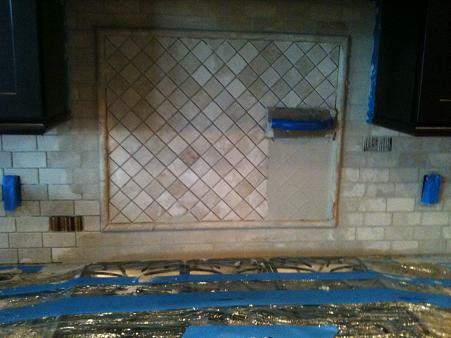 We grouted the lower area and accent band and then got the top area ready to grout. 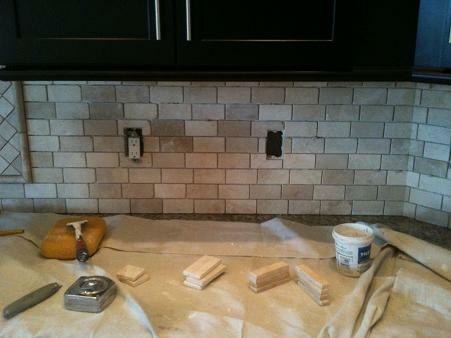 Once everything was grouted we caulked the perimeter joints with a matching caulk to allow for movement. 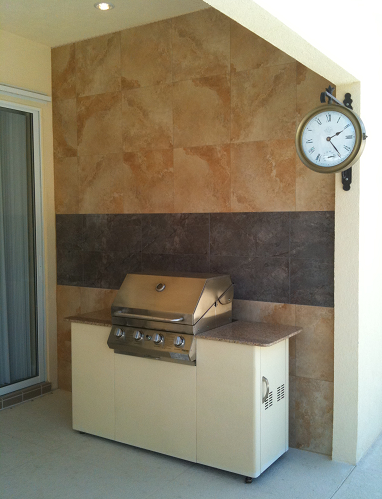 Then we did one final wash to clean the wall of any haze and rolled the grill back in place for the homeowner. 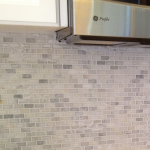 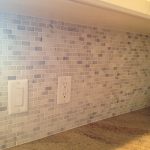 We did a White Carrara mini brick marble mosaic backsplash installation in Wesley Chapel, Florida and wanted to talk about it. 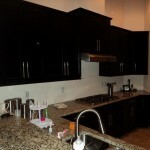 The best way to do that was to write a blog about it on my website. 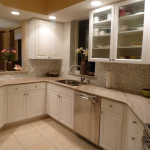 They contacted me asking if I could give them an estimate to install a kitchen backs splash. 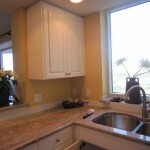 They just redid their kitchen with new white cabinets and granite counter tops so we talked about what they had in mind. 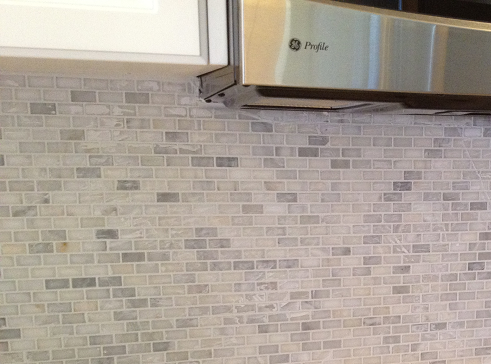 They wanted to go with something white, so I told them about white glass tile or a white 3×6 subway tile. 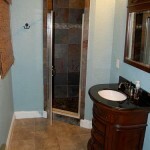 I emailed them some pictures of similar installs we did. 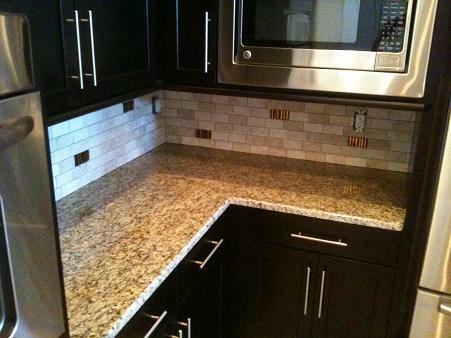 They liked the look of them but it wasn’t what they wanted. 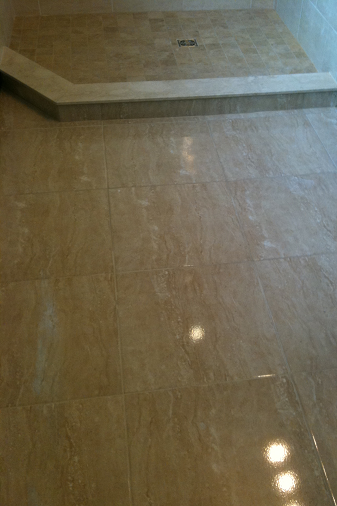 I then told them about Thassos white and White Carrara aka Bianco Carrara in Hexagon, Rhomboid & Mini Brick marble tile. 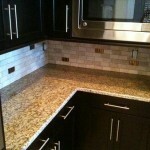 Right off the bat they really liked the mini brick style and thought it would go great with the new kitchen style. 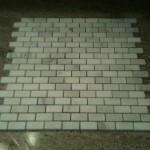 I sent them to one of the tile showrooms we use and they were able to find a very nice colored White Carrara mini brick they had in stock. 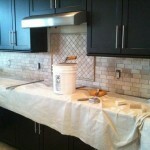 While there they also selected a white grout and a penetrating sealer. 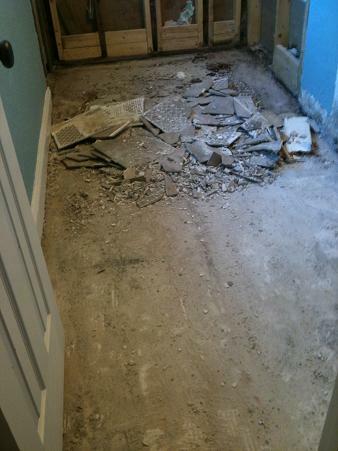 The tile was in stock so they told me to proceed with the job when I could schedule it. 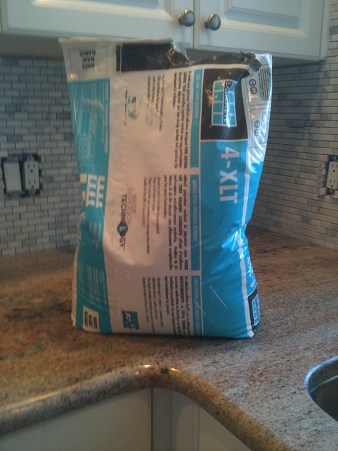 I placed the order for all of the material for their project and picked it up the day I started the project. 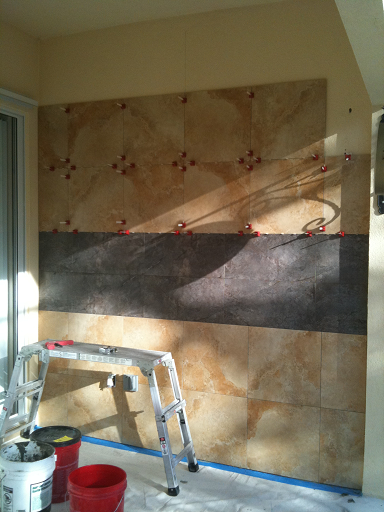 I had also purchased some Laticrete 4XLT thinset, which is a non-sag mortar and great to put up mosaic sheet like these. 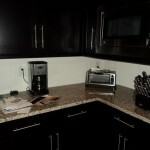 When I got to the job the new cabinets were already installed and granite counters were in. 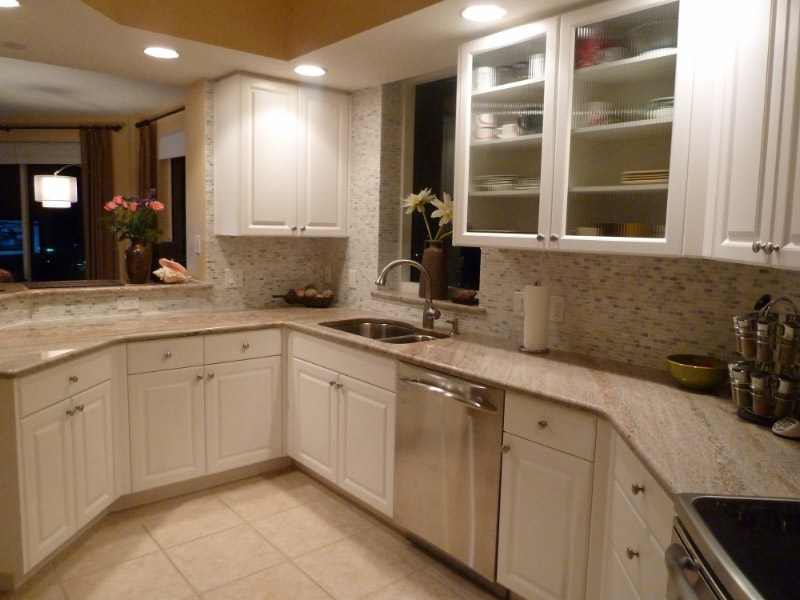 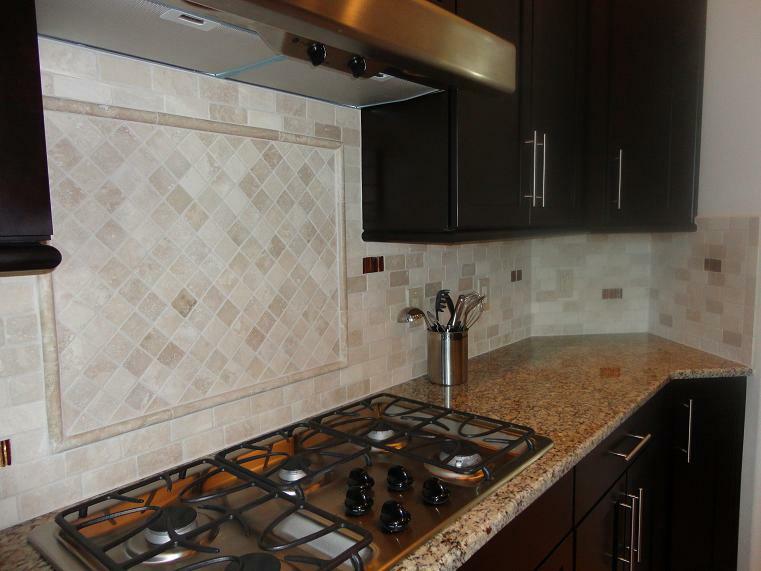 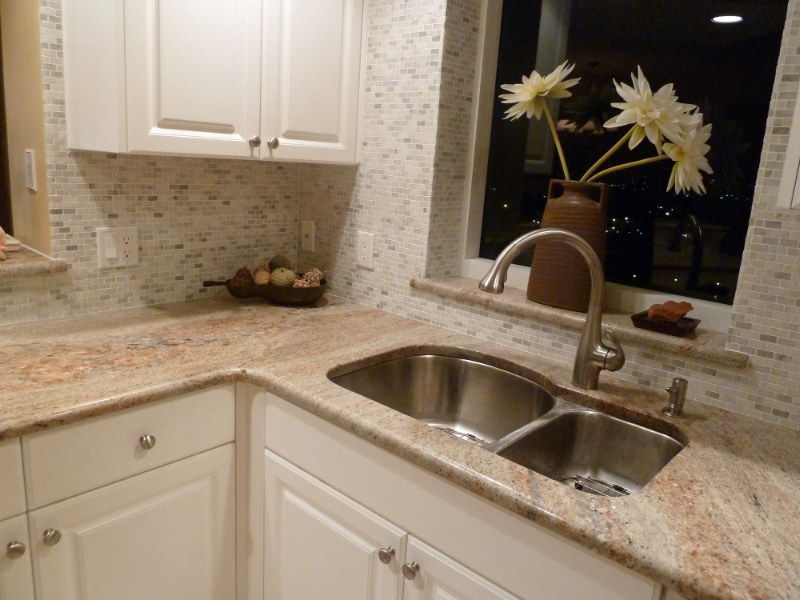 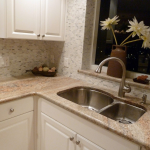 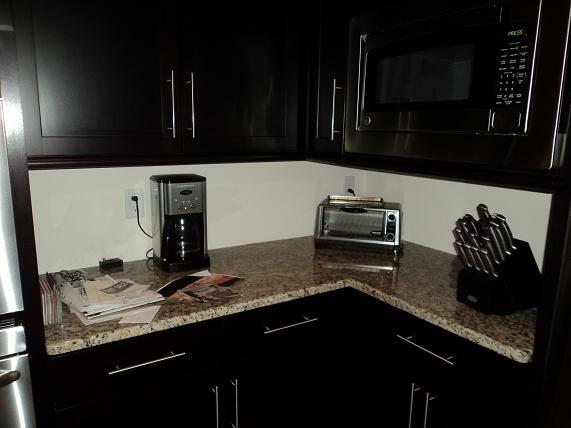 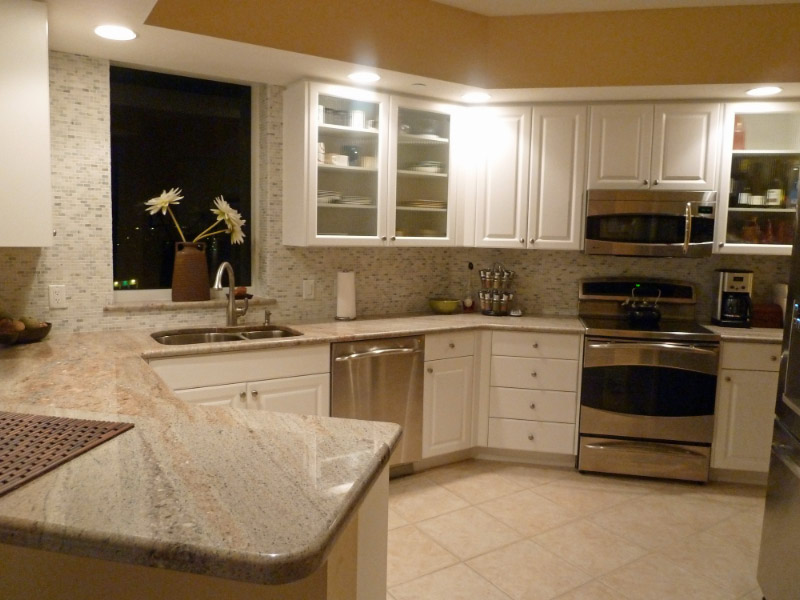 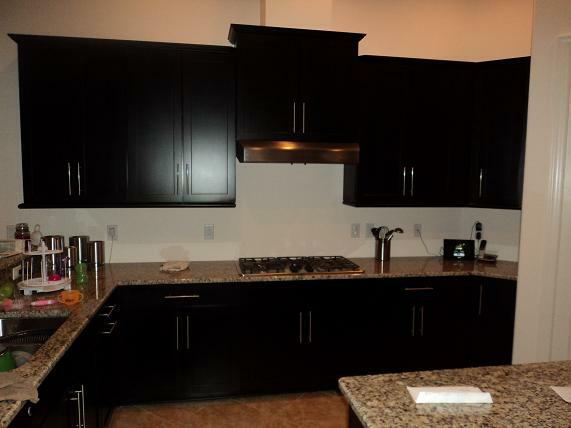 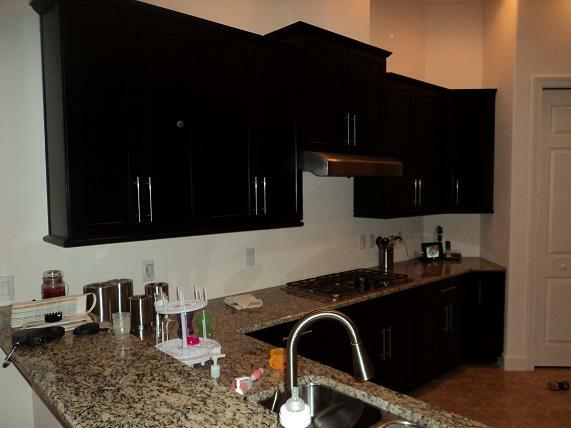 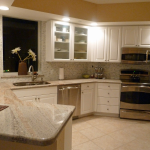 We had told them to leave off the 4″ granite splash so we could run the tile down onto the counter, which they did. 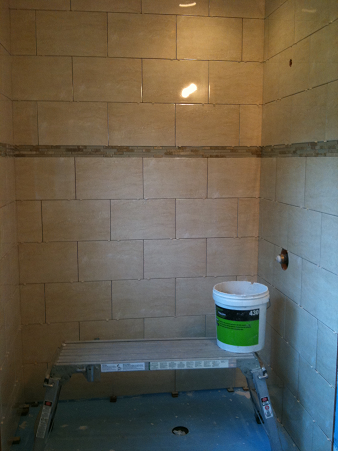 I went though all of the boxes to make sure the tile was perfect, good sheets, not chipped and consistent in color. 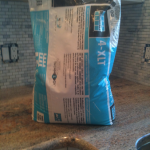 I had my helper stack them in piles and then cover the granite counters with our canvas drop clothes prior to working on them. 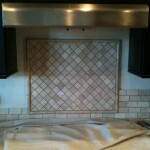 I then looked at the backsplash and decided what would look best and then planned the layout. 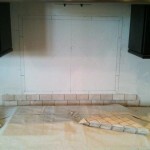 I decided that starting the tile from the tall window corners would be best. 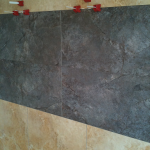 The tile is mounted on sheets and I could make the corners look good by over lapping the outside edge. 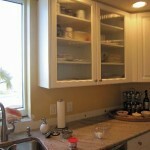 This would create a nice looking corner at the large window opening which is a focal point of the kitchen. 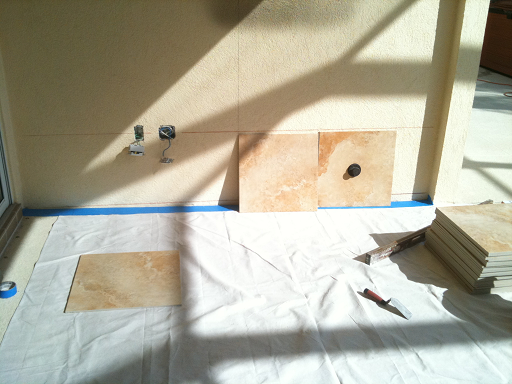 The sheets fit perfectly into each other as I worked outward from the window setting the tile. 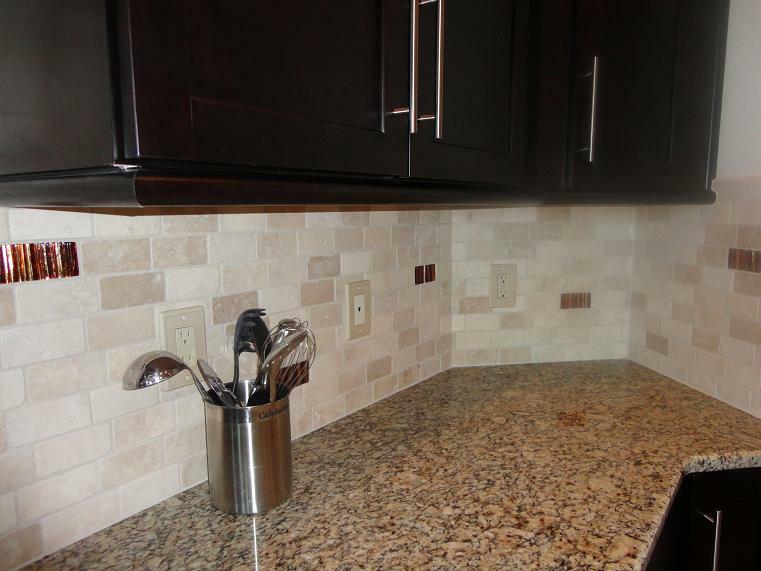 The size of the tile was perfect to start with a full tile on the bottom row at the granite and hit with a full tile up under the cabinet. 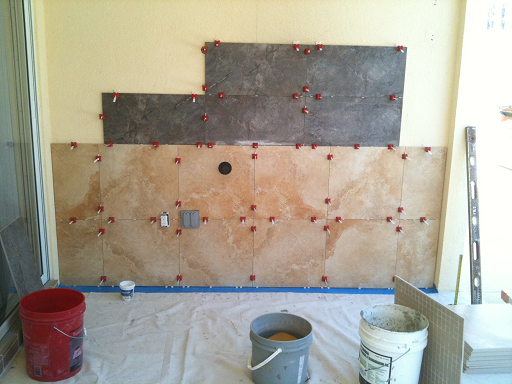 Using the non-sag thinset really helped hold the sheet mosaic up on the walls without having them slide. 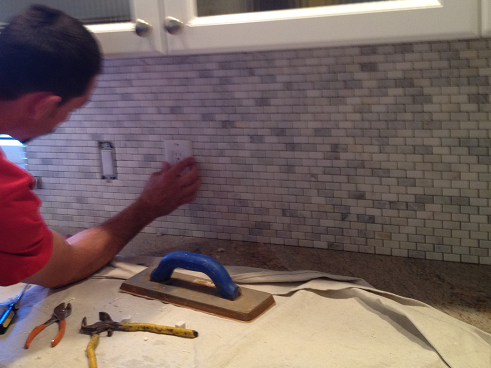 It took us one long day to install all of the tile on the back splash. 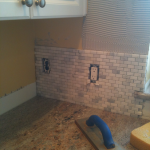 We finished setting the tile, checked to make sure the outlet plates covered the tile cuts and allowed the thinset to dry over night. 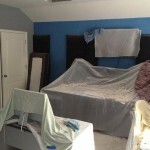 The next morning we got there and the thinset was set up good. 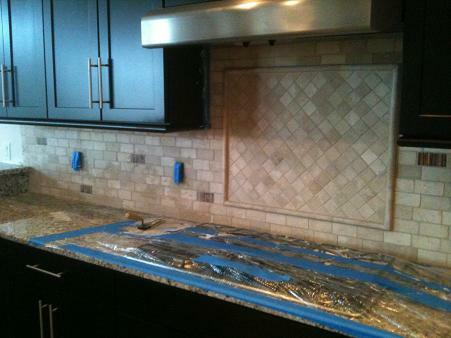 We sponged down the tile, cleaned the counters of dust, made sure outlets were covered with tape and prepped to grout. 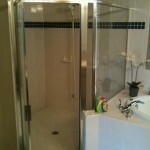 Here are picture of this installation and the last 3 are from the owner. 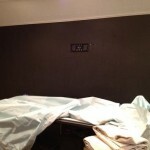 Also a note from the owner….. 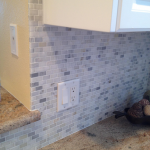 I recently completed a custom 2×4 Tumbled Travertine back splash with random glass tile accents in Lutz, Florida and I wanted to talk about it. 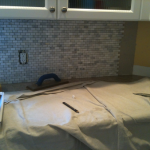 I was contacted by a customer who seen a few pictures of back splashes and wanted me to give them an estimate on a similar installation in their new home. 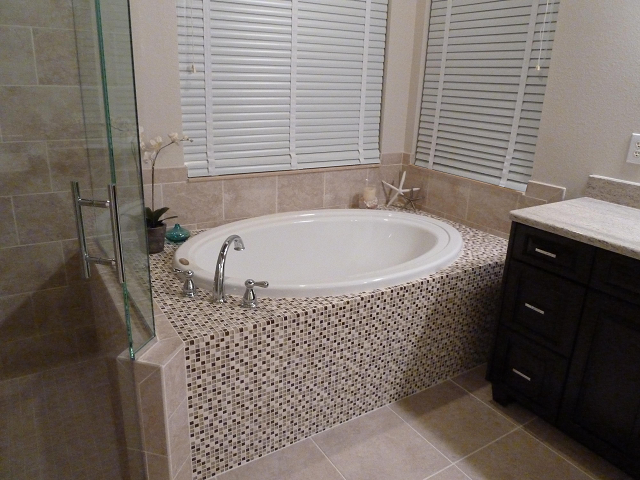 I was able to find the exact tile they had on a picture they had seen online that they liked. 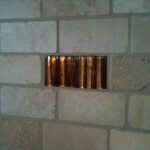 It was a Jeffery Court tile called Quartz Fire & Ice Brick. 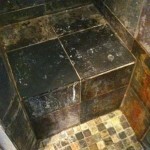 I located the tile through a couple places and it was pricy. 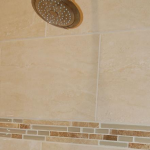 On top of that the shipping from Southern California to the Tampa Florida area was high and the texture of the tile for grout gave them second thoughts. 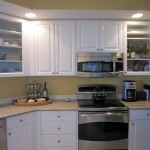 I gave them the price and it was reasonable but I showed them a few picture of it installed in other kitchens which led them to decide against it. 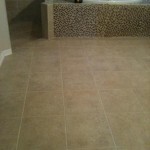 I then sent them to Tampa Tile, one of my tile suppliers in the Tampa area. 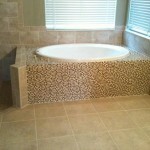 They met with my sales person and she helped them with a few designs and styles. 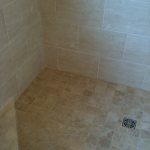 They looked around for a while and then made a final decision on a 2×4 Paredon “Durango Cream” tumbled travertine in a 1/4 offset subway pattern. 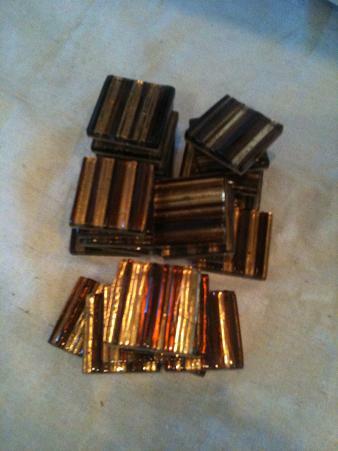 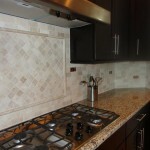 The glass tile accent they selected was a Vetrissimo “Murano Decorato” 2×2 Tozzetto in color Gold/Brown. 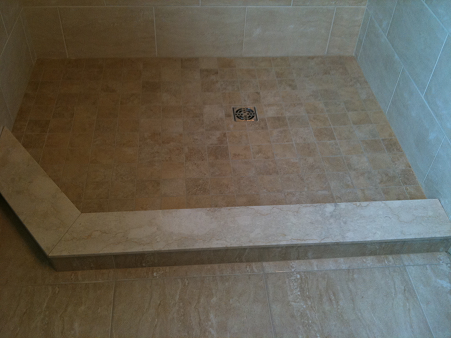 The customer told me that the help they received from the showroom I sent them to was above the norm which they liked. 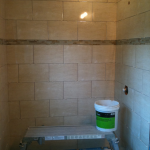 All tile was then ordered and a schedule start date was set. 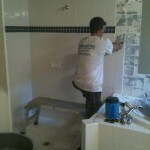 The tile all came in within a week and we had scheduled the project for 2 weeks out. 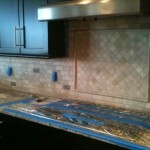 The day we started we first covered the granite counter with our canvas drop clothes to protect them. 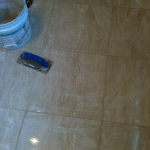 Then I opened the boxes of 2×4 & 2×2 tumbled travertine along with the 1×12 dome pencil liner and the glass tile and inspected them for any problems. 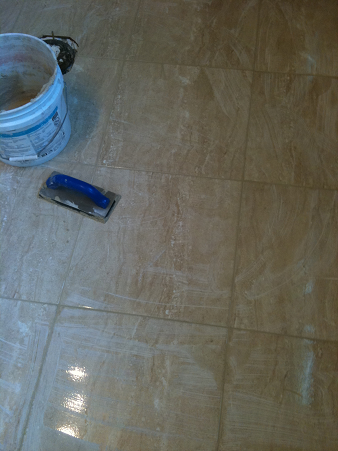 All of the tile was in good shape, same shade, no chips, etc.. 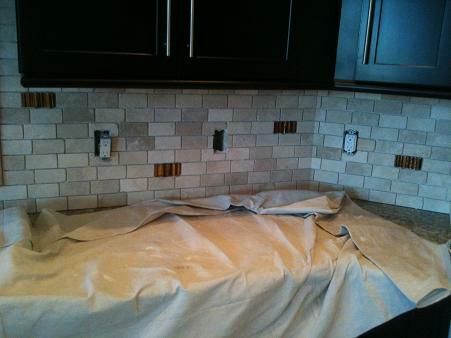 I then removed the outlet covers and started to do the tile layout on the backsplash. 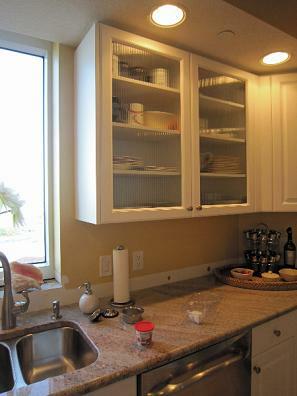 The main area of focus was on the framed design the customer wanted behind the range. 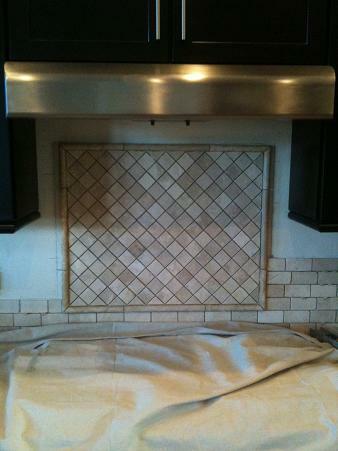 They wanted a diagonal area of 2×2 tile framed out by the 1″x12″ dome pencil liner. 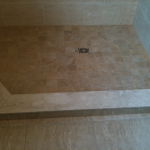 I laid it out so I would have full diagonal halves inside the picture frame of travertine dome liner. 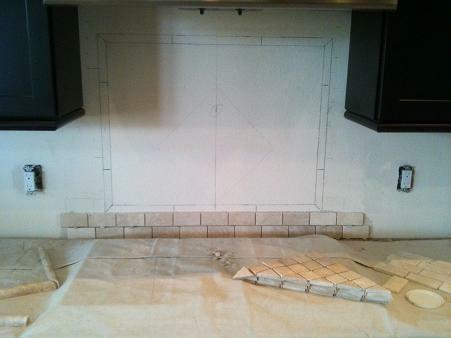 Once that was done I set the lower 2 rows of 2×4 tile under the area that would be framed and then set the dome liner and the diagonal 2×2 tile. 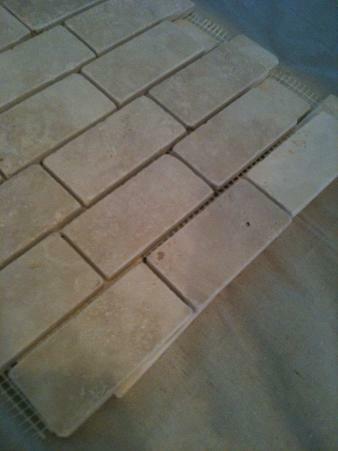 I did it this way so I could make sure it all lined up and I also used the lower rows as support. 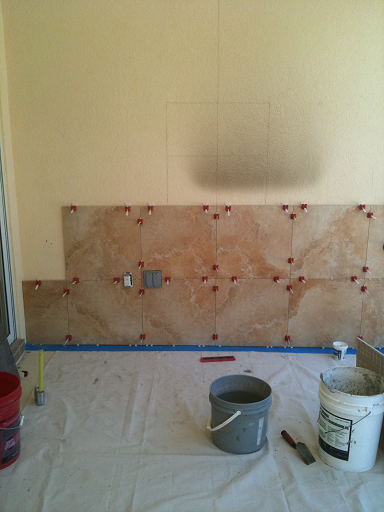 After that area was installed I started setting the sheets subway travertine on the left and right sides of the back splash. 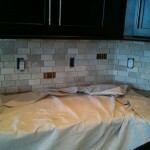 I was using Laticrete 4XLT as the thinset on this project. 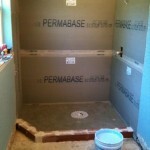 It helped with the installation since its a non sag mortar. 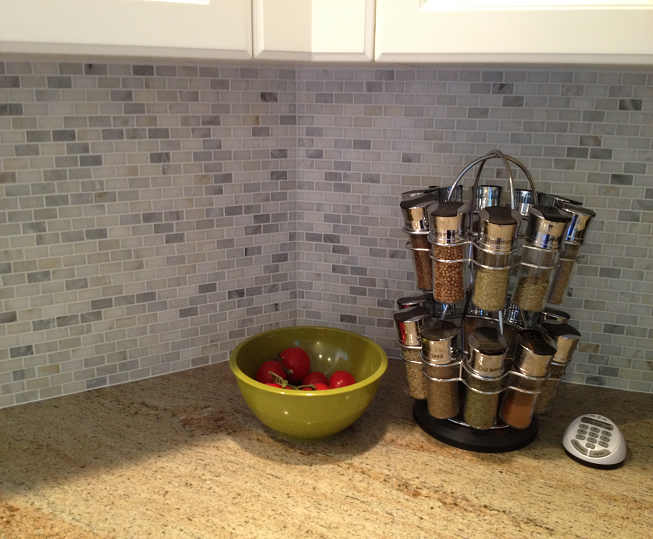 You can spread the wall and set the tile without the tile sliding. 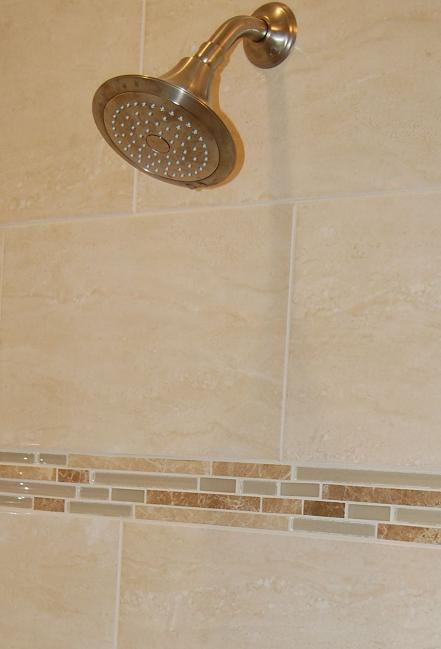 It is made for extra large tile, but I find it better used on small mosaic tile like glass, porcelain or marble so they stay in place. 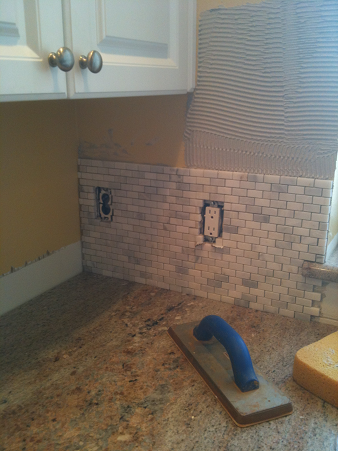 Once all of the tile was set on the main back splash and the other section across the kitchen. 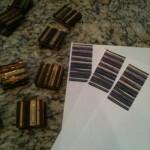 I then made some copies of the glass tile and cut them out. 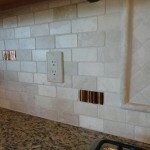 I taped them on the tile for the customer to decide where they exactly wanted the glass accents to go. 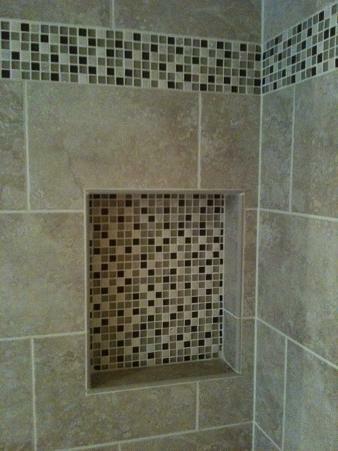 I felt it was easier doing it this way then installing the glass tile and them deciding to move one. 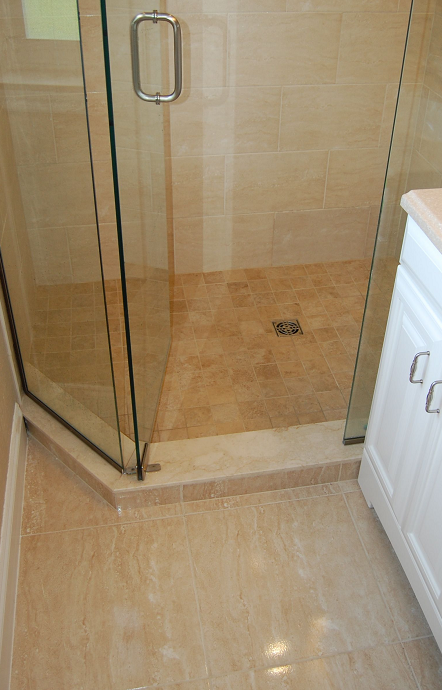 Which could possibly ruining the glass tile by chipping it. 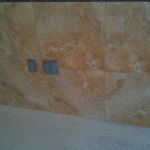 After the copies were placed in the right spots and the owners liked it I removed the 2×4 travertine in those areas. 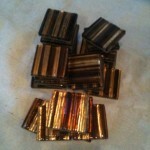 The thinset wasn’t fully cured yet and they came of fairly easy. 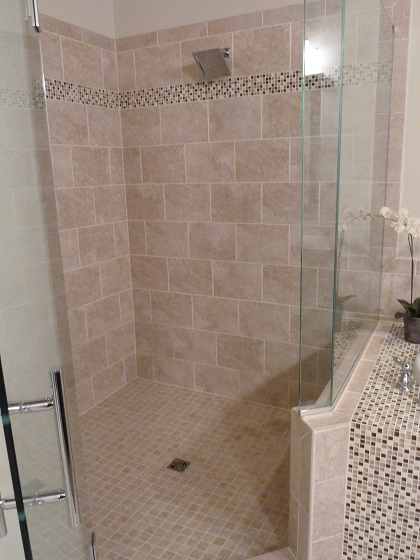 I then installed all of the glass tile accents in those spots selected and called it a day. 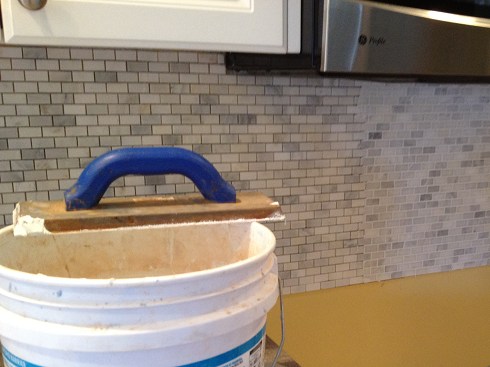 The next day after the tile was dry I showed up to grout the travertine back splash. 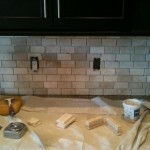 The grout used was a Laticrete sanded grout #23 Antique White. 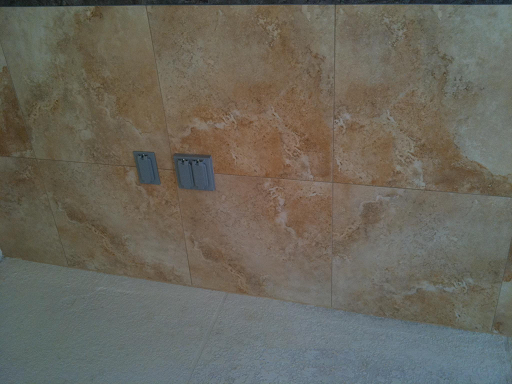 Clean up of the grout was easy and after the final wash I installed new travertine colored resin outlet covers. 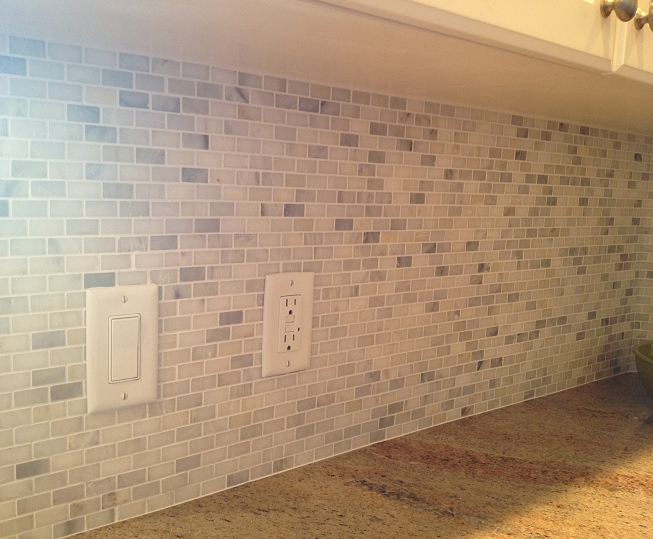 It was a nice touch to finish off the backsplash. 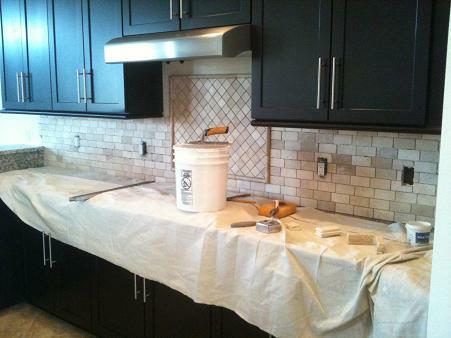 Enjoy the progress photo’s of this beautiful back splash.